Christopher Persson is a longtime entrepreneur whose first job was as a plate cleaner in a bakery at the age of 14. Moving swiftly through the ranks to become chief cinnamon bun maker he was bitten by the entrepreneurial bug and hasn’t looked back since. Following university studies, Chris entered the world of banking and had a stint at Alfred Berg Investment Bank in Stockholm. Here he was part of the team that built up the socially responsible banking brand Banco Fonder. Just before the internet heydays started in the early 90s, he moved from Stockholm to London to setup the UK arm of consultancy firm BTS Group. Since the floatation of BTS, Chris has started many companies and then led them to high growth through rapid internationalisation throughout Europe and the US. Digital companies where Chris has been been involved include Vielife (sold to Cigna Healthcare), Fourth, Bookatable (sold to Michelin) and Lina's Matkasse. 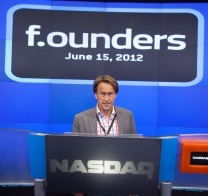 Christopher Persson presenting at F.ounders - an organisation for entrepreneurs - hosted at Nasdaq. Christopher Persson has also received the award London Pub of the Year 2007 for his previously owned pub.